Now-a-days, people are more concerned about their mobile balance than the total balance in their bank account. They try to save as much of their mobile balance as they can and, whenever they got an offer of extra talktime, free airtime, coupons, etc., it’s a BIG deal for them. And, I am sure, you too utilize these offers instantly. But we get to know about these offers only if we are too lucky because these offers are very infrequent, available to specific region and for limited period of time which is not good. So, do you want to get regular offers and free recharges? Well, if your answer is “Yes!” then today I am telling your some cool android apps to get free mobile recharge. 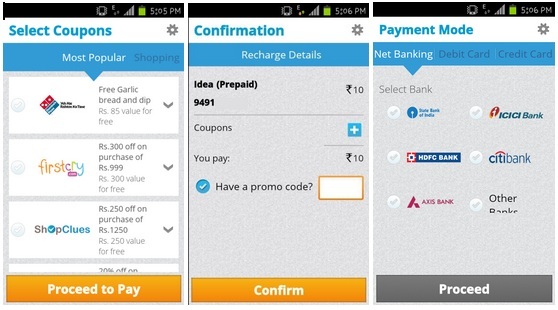 These apps are providing free mobile recharges, discount coupons, cashbacks, credits almost daily. The app is developed for the sole purpose to provide FREE TALKTIME to its users. By performing various activities on mobile, users can earn free talktime. Basically, Earn Talktimeapp provides you credits for performing activities like installing app, register on a website/app, answering polls & surveys, watch videos and inviting friends. The credits can be redeemed anytime for performing free mobile recharge and get free talktime. 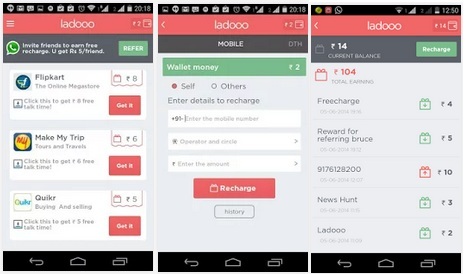 Ladooo is quite effective app for indian users who want free mobile recharge. All you need is your smartphone with fast internet connection and Ladooo app installed in it. Open Ladooo and you’ll have lots of apps listed in its home with credits written in right side. Install the listed apps and Ladooo will add that credit amount to your Ladooo account which can be used anytime to get the recharge of same credit value or lower than it. 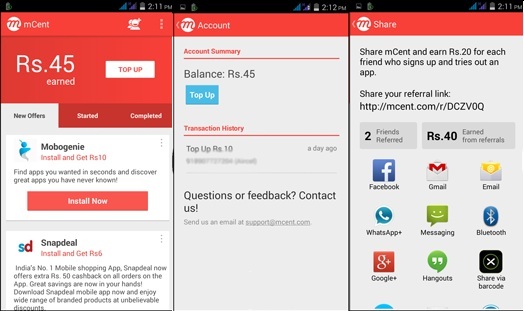 mCent is another cool way to discover amazing apps, install them and get free mobile recharges. Following the similar idea of Ladooo app, the app is also providing you free credits for installing apps. You can use this credit to recharge your own or any of your friend’s mobile phone. Well, it’s not a online free mobile recharge app instead, it’s a cash reward app. Similar to earn talktime app, you earn points by performing small tasks and when you’ve crossed the threshold limits, you can redeem your credits to get HOT CASH directly to your PayPal account of get Amazon gift card of same value. Hike is already very popular app for providing free messages not only from Hike to Hike but also from Hike to other users which are not in Hike. They have a rewards section where they are providing you opportunity to earn cash. On new sign-ups, they’re providing Rs. 20/- free talktime, on your friends’ sign-up to the app through your link, you’ll get Rs. 20/- cash every time and whenever the amount reaches Rs. 50/-, you can recharge your mobile phone with this amount. The app provides quick, safe and simple online mobile recharges, Postpaid bill payments, DTH recharges and Datacard recharges. The app doesn’t directly provide free recharges officially but you can enjoy equal value Freebies / Offers from merchants such as McDonald’s, CCD, Costa Coffee, PVR, etc. and save money. 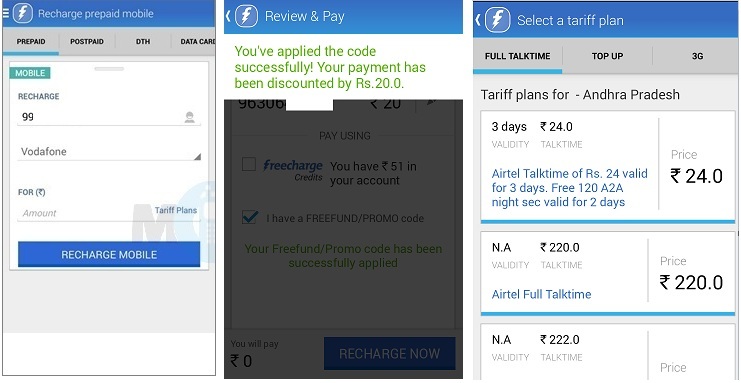 Moreover, just google “FreeCharge Coupon” and you’ll get numerous coupons providing huge discounts, cashbacks on recharges that you perform from FreeCharge, just make sure the offer/coupon is currently valid. PayTm is another secure apps to perform online recharges for mobile, DTH and shop products like dresses, footwears, electronic gadgets at lucrative discount. This app also have regular coupons and offers getting published on world wide web. Just search Paytm Promo Code, Paytm Offers or Paytm Coupons, you’ll get great discount coupons and valid cashback offers within few minutes. After providing millions worth Free Recharges, the app POKKT has now arrived to android platform. The app is providing you very easy option to earn free talktime. All you need to do is just complete some offers provided inside the app. You’ll find offers like download app, complete survey, etc. Just complete your favorite offers and get credited instantly. 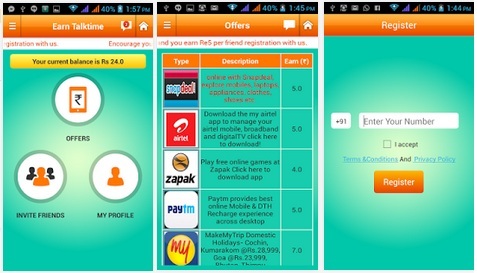 Free+ app is providing free mobile recharges to indian users. Concept is same, but the app is more user-friendly and you may get more offers in this app in comparison to other free mobile recharge app. Anyways, try it and share your feedbacks in comment-box below. 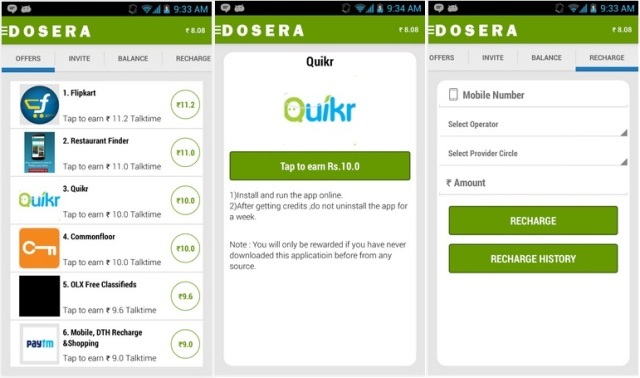 Dosera app is another great free mobile recharge app which have totally different app offers to earn free recharges than other free mobile recharge app. 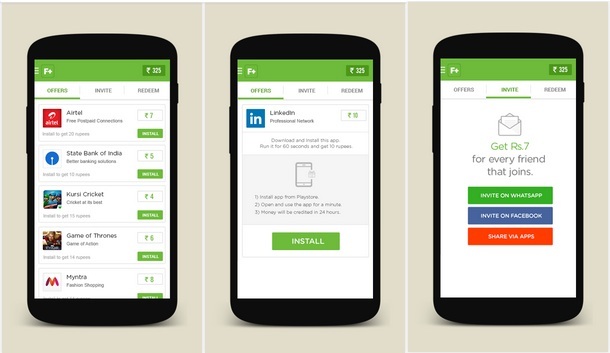 So, you can actually have other free mobile recharge apps with this app installed in your smartphone. 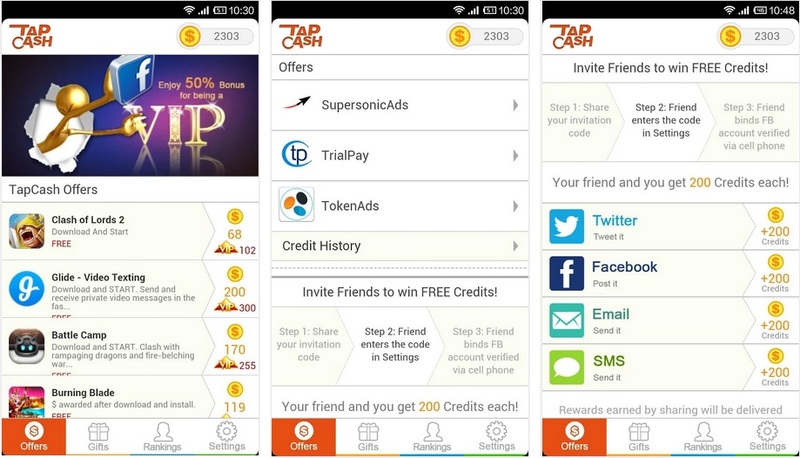 Task is simple and similar: download the app > open it > explore > get credits. For this moment, just a tip: Gaana App is providing free talktime of Rs. 50/-. So new users, just install Gaana app to your mobile phone, login with Facebook and within few minutes, you’ll get Rs. 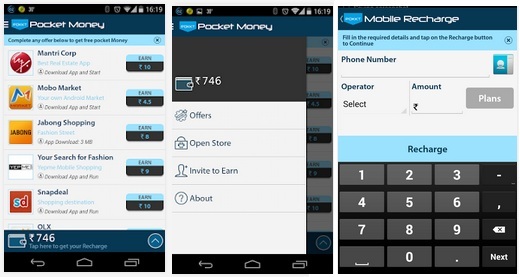 50/- Paytm coupon code that you can use to pay your mobile, DTH bill for free.